Here is the sixth installment of TV Triva For You from TV Banter . The first installment appeared on this blog on June 14, 2012. The second installment appeared on February 6, 2013, the third appeared on June 30, 2014, the fourth on November 14, 2014, and the fifth on June 20, 2015. 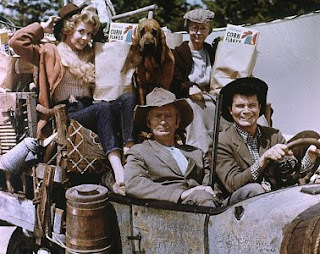 What is the make and model of the Clampetts' beat-up old truck on The Beverly Hillbillies? DID YOU KNOW that the ramshackle old roadster on The Beverly Hillbillies was based on a 1921 Oldsmobile Model 43-A touring car? According to an article by Jack Stewart on the website The Daily Drive, the truck "was powered by a 43-horsepower 4-cylinder engine and rode on a 115-inch wheelbase. The $1,445 touring car was considered medium priced when it was new." Renowned Hollywood auto customizer George Barris (1925-2015) was assigned the task of designing a vehicle befitting the hillbilly Clampett family. In his article on the famous vehicle, Stewart stated that Barris added a rear platform and a high platform to accommodate Granny and Elly May. If you're wondering what happened to the Clampetts' dilapidated old truck, here's the answer. It is the best-known exhibit at the Ralph Foster Museum on the campus of the College of the Ozarks, a private Christian school located at Point Lookout, Missouri (64.4 kilometres or 40 miles south of Springfiled, near Branson and Hollister, Missouri). 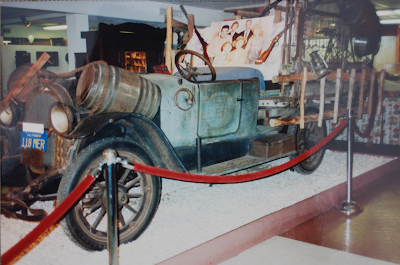 Paul Henning, the creator and producer of The Beverly Hillbillies, donated the truck as a Bicentennial gift to the Foster Museum, referred to locally as "the Smithsonian of the Ozarks." Henning, who passed away in 2005, who also composed the show's popular theme, "The Ballad of Jed Clampett," He was born and raised in Independence, Missouri, about a 2 hour and 44 minute drive from Springfield. If you should visit the Ozarks and happen to be in the vicinity of the Ralph Foster Museum, you can have your picture taken in the broken-down front seat of the Clampett truck in front of a large photograph of Jed Clampett, Granny, Elly May Clampett, Jethro Bodie. Milburn Drysdale and Jane Hathaway. Below is a photo of one of television's most famous vehicles at the museum. TRIVIA NOTE: Miss Jane Hathaway, played by Nancy Kulp, was usually behind the wheel of a Dodge convertible. The wealthy and extravagant Mrs. Margaret Drysdale was chauffeured in Imperials. Who was the youngest host of Saturday Night Live? DID YOU KNOW that Drew Barrymore has the distinction of being the youngest host of Saturday Night Live? 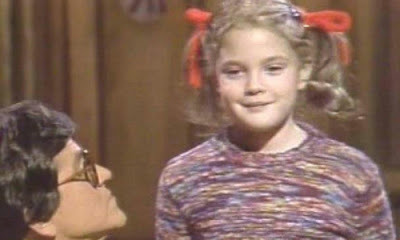 Drew was a mere seven years old when she hosted SNL on November 20, 1982. The actress, now 41, was not yet born when Saturday Night Live first aired on October 11, 1975 (Her date of birth is February 22, 1975). At the tender age of seven, Drw participated in sketches and delivered monologues. In one sketch she portrayed a murderous Gertie (her E.T. character) before allowing Tim Kazurinsky to babysit her. In 1982, Barrymore was riding high on the popularity of her performance in the blockbuster film E.T. To date, she has hosted SNL five more times. Her sixth and most recent appearance as the show's host occurred on October 10, 2009. She joined the SNL Five Timers club when she hosted Saturday Night Live for the fifth time on February 3, 2007. * Macauley Culkin of Home Alone fame was 11 years old when he hosted Saturday Night Live in 1991. * Fred Savage, star of The Wonder Years, was 13 when he hosted SNL in 1990. * Jodie Foster was 14 years old when she hosted Saturday Night Live back in 1976. 1976 was a big year for Foster with her performances in the films Taxi Driver and Bugsy Malone. TRIVIA NOTE: Bugsy Malone was a British musical gangster film set in New York. It featured only child actors and starred Scott Baio in the title role. * Cosby Show alumnus, Malcolm-Jamal Warner,, was 16 years of age when he hosted Saturday Night Live on October 18, 1986. * Actress Lindsay Lohan was 17 years old when she hosted SNL on May 1, 2004. * Twins Mary Kate and Ashley Olsen, who shared the role of Michelle Tanner on Full House, were also 17 when they hosted Saturday Night Live on May 15, 2004. * Singer/actress Miley Cyrus, born November 23, 1992, was 18 years old when she hosted SNL on March 5, 2011. * Singer Britney Spears was also 18 when she hosted the show on May 13, 2000.
Who was the original choice to play George Costanza on Seinfeld? DID YOU KNOW that Jason Alexander was not the original choice to play George Costanza on Seinfeld? It's hard to imagine anyone else in the role. 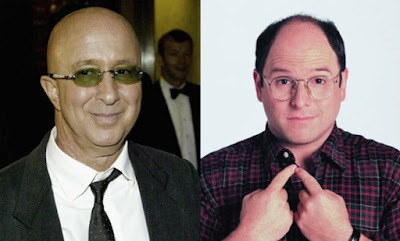 However, David Letterman's longtime band leader and sidekick, Paul Shaffer, was apparently offered the part of the neurotic George before it was given to Jason Alexander. According to Shaffer in his 2009 autobiography We’ll Be Here for the Rest of Our Lives, Jerry Seinfeld left him a personal message offering him the role of Cosstanza on his upcoming pilot. The role was his, if he wanted it, without even an audition. As fate would have it, Shaffer neglected to return Seinfeld's call because he was preoccupied with other work. Of course, the Canadian-born band leader had no way of knowing how successful Seinfeld's "show about nothing" would become. It worked out for the best, however, because nobody could have played George Costanza as well as Jason Alexander.